ZURICH (AP) — FIFA says a former African player of the year and Confederation of African Football executive committee member had his ban for taking cash payments cut on appeal. FIFA's appeal panel reduced Kalusha Bwalya's ban from soccer to the time he already served. His fine was reduced to 10,000 Swiss francs ($10,090) from 100,000 Swiss francs ($100,900). JOHANNESBURG (AP) — Louis Oosthuizen, the 2010 British Open champion, led the South African Open by a shot after a 9-under 62 in the first round on Thursday. LUSAKA, Zambia (AP) — Britain's Prince Harry has met with military veterans in Zambia during events to commemorate those who served in World War I and World War II. The Duke of Sussex, who served in the British army, on Tuesday wore his military medals on a civilian suit as he greeted Zambian servicemen in uniform and posed for photographs at the Burma Barracks in Lusaka, the Zambian capital. LUSAKA, Zambia (AP) — Britain's Prince Harry is in Zambia for a two-day visit during which he will attend a commemoration of Zambian military veterans and meet Zambian officials, social workers and young entrepreneurs. A girl with flowers and traditional dancers welcomed Harry after he stepped off a plane in the Zambian capital of Lusaka on Monday. The Duke of Sussex later planned to attend a reception celebrating ties between Britain and Zambia. 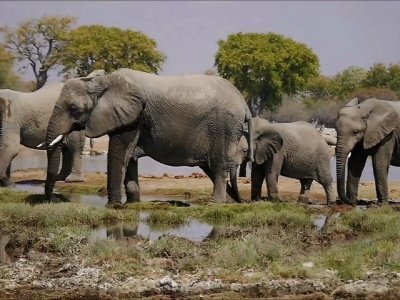 JOHANNESBURG (AP) — Botswana, long viewed as a rare refuge for African elephants, is coming under increasing threat from poachers. Poachers are killing elephants in the southern African country in growing numbers after wiping out large numbers of elephants in nearby Zambia and Angola, a conservation group said. HARARE, Zimbabwe (AP) — Senior Zimbabwean opposition figure Tendai Biti on Thursday was charged with inciting public violence and declaring unofficial election results as fears grew about a government crackdown following the disputed July 30 election. The United States' top diplomat for Africa says he is "deeply troubled by credible reports that opposition supporters are being targeted by members of the Zimbabwean security forces" and that senior opposition official Tendai Biti has fled the country. JOHANNESBURG (AP) — Congo opposition leader Moise Katumbi has been blocked from entering the country to register as a candidate in December's long-delayed presidential election, a spokesman said Saturday, as a dramatic attempt to drive in from neighboring Zambia appeared to fail. Zambia's government told Katumbi of the refusal by Congolese authorities, Olivier Kamitatu Etsu said in a post on Twitter, adding: "Have you ever seen a government forbid a so-called fugitive to turn himself in?" LUSAKA, Zambia (AP) — Police in Zambia say at least 10 miners are dead after a mine dump collapsed about 500 kilometers (310 miles) from the capital, Lusaka. Illegal mining has been a sensitive subject for the government of the southern African nation for years. It was not immediately clear what caused the collapse. Copperbelt Province police commissioner Charity Katanga says 10 bodies have been retrieved and several other people were injured. PORTLAND, Maine (AP) — A Maine high school student who fled his native Zambia says the experience of participating in a national spoken poetry competition was "heaven" even though he didn't advance. Deering High School junior Allan Monga had to go to court to become one of 53 participants Tuesday in the national Poetry Out Loud competition in Washington, D.C. The National Endowment for the Arts says it looks forward to welcoming an upcoming poetry contest's 53 finalists, including a high school student who fled his native Zambia for Maine and won a legal fight to compete. PORTLAND, Maine (AP) — A high school student in Maine who fled his native Zambia can compete in a U.S. government-funded poetry contest, a federal judge ruled Friday. The National Endowment for the Arts had blocked the 11th-grader's participation, saying he doesn't meet their U.S. citizenship rules. PORTLAND, Maine (AP) — Lawyers for a high school student who fled his native Zambia and is suing to compete in a government-funded national poetry competition say the case is about an "educational benefit" for any public school student. Allan Monga of Deering High School won the Maine "Poetry Out Loud" contest. He applied for asylum in the U.S., but hasn't been granted legal residency. He's not being allowed to compete in the National Endowment of the Arts' "Poetry Out Loud" contest next week. NASHVILLE, Tenn. (AP) — Meharry Medical College and the Morehouse School of Medicine have formed a partnership with the University of Zambia to develop an international exchange program focused on disease research and prevention. Officials at Meharry said the program will focus on seven core areas of health, including: HIV and AIDS, cancer, HPV, late-onset diabetes, hypertension, infectious disease and malnutrition. University of Scranton students Jaclyn Campson and Marissa Frank launched True Thabo, a nonprofit organization that provides schools in Africa with clean water. Jaclyn, an occupational therapy major from Massapequa, New York, and Marissa, a marketing major from Cranford, New Jersey, have already supplied over 500,000 liters of clean water to schools in Zambia through the nonprofit. WASHINGTON (AP) — The Trump administration has quietly decided once again to allow Americans to import the body parts of African elephants shot for sport, despite presidential tweets decrying the practice as a "horror show." JOHANNESBURG (AP) — Several southern African countries have recalled some processed meats from South Africa after the deaths of 180 people there from contaminated food since early last year. The African News Agency reported Tuesday that Swaziland, Zambia and Mozambique are among nations that have ordered the removal of meat products believed to be contaminated. JOHANNESBURG (AP) — Zambia has struggled to contain one of its deadliest cholera outbreaks in years, sending soldiers into a slum last week to keep order, collaborating with the World Health Organization on a vaccination program and even declaring a week of prayer. ADDIS ABABA, Ethiopia (AP) — Ethiopian Airlines says it has finalized an agreement with Zambia to re-launch the southern African country's national carrier. LUSAKA, Zambia (AP) — Zambia's army has stepped in after some residents in the capital rioted over the removal of market vendors amid a deadly cholera outbreak. Security forces have been clearing streets of the vendors as cholera cases in Lusaka have risen above 2,500 with at least 58 deaths. Residents of the densely packed Kanyama slum rioted in protest on Friday, destroying property and looting nearby shops. JOHANNESBURG (AP) — Zambia is set to vaccinate one million people in its capital against cholera as a deadly outbreak grows. The World Health Organization says doses of the cholera vaccine have been delivered to the impoverished southern African nation as fears spread in Lusaka. Zambia's health ministry says 58 of the 63 countrywide deaths in the cholera outbreak that began in early October have occurred in the capital. Of the 2,672 cases across the country, 2,558 have been in Lusaka. MINERAL WELLS, TEXAS - Katherine Louise Milling and Kyle Berton Curry both of Zambia, Africa were married on October 21, 2017. Parents of the couple are Charles and Karen Milling of Fort Worth, Texas and Kendall and Robin Curry of Columbus. The wedding was held at the Brazos River Family Ranch in Mineral Wells, Texas. BLOOMSBURG, Pa. (AP) — Bethany Noll's parents knew something was wrong with her hearing by the time she was three. Their daughter sat too close to the television, and her speech was delayed. "I wouldn't respond when they said they had candy," she said. At four she was fitted with her first set of hearing aids, purple with pink and purple swirled ear molds. For the first time, standing in the family driveway, she could hear the birds sing. WASHINGTON (AP) — One month before the Trump administration sparked outrage by reversing a ban on trophies from threatened African elephants, federal officials quietly loosened restrictions on the importation of heads and hides of lions shot for sport. WASHINGTON (AP) — The Trump administration said it will allow the importation of body parts from African elephants shot for sport, contending that encouraging wealthy big-game hunters to kill them will aid the vulnerable species. Nigeria was the first team from Africa to qualify for the World Cup in Russia, doing it with a game to spare and emerging from the so-called 'group of death' after beating Zambia 1-0 at home on Saturday. The victory, clinched by substitute Alex Iwobi's goal with 17 minutes to go, ensured Nigeria will win Group B and qualify for the World Cup for the sixth time in the last seven tournaments. President Donald Trump lavished praise on the health care system of Nambia during a speech at the United Nations. But there's one little problem -- there's no such country. "In Guinea and Nigeria, you fought a horrifying Ebola outbreak," Trump told African leaders gathered Wednesday. "Nambia's health system is increasingly self-sufficient." Algeria may regret the decision to allow Riyad Mahrez to leave the team camp to sort out his club future. Without its best player, Algeria lost 3-1 in Zambia in World Cup qualifying on Saturday to stay last in its group. The defeat to a Zambia team that played most of the second half with 10 men leaves Algeria — Africa's top-ranked team a few years ago — with little hope of making it to Russia next year. LUSAKA, Zambia (AP) — The Lusaka high court has dropped treason charges against Zambia's most prominent opposition leader and released him from custody. The United Party for National Development leader Hakainde Hichilema had been detained since April. Authorities had accused him of blocking President Edgar Lungu's motorcade with his own convoy. The Director of Public Prosecutions asked the court to discharge Hichilema. HARLINGEN — So much with so little. That seems to sum up the Rev. Meizie Salinas’ impression of Malawi and Zambia after a recent mission trip to Africa. “It was a very inspiring trip,” said Salinas, a deacon at Treasure Hills Presbyterian Church, 2120 N. Ed Carey Drive. JOHANNESBURG (AP) — Zambian media say 93-year-old Kenneth Kaunda, the country's independence leader and its former longtime president, has left a hospital after several days of treatment. State broadcaster ZNBC reports that Kaunda went home Saturday from the hospital in Lusaka, the Zambian capital. He will return at an undisclosed time for previously scheduled tests. ZNBC had earlier quoted the health minister as saying Kaunda had been suffering from "minor complaints." JOHANNESBURG (AP) — Zambian media say 93-year-old Kenneth Kaunda, the country's independence leader and former longtime president, is hospitalized. State broadcaster ZNBC reported Wednesday that Kaunda was admitted Tuesday evening to the University Teaching Hospital in Lusaka, the capital. ZNBC quotes Health Minister Chitalu Chilufya as saying Kaunda is in stable condition after "minor complaints" and could leave the hospital by Thursday. JOHANNESBURG (AP) — A baboon in Zambia has interfered with machinery at a power station in a tourist town near Victoria Falls, knocking out power to tens of thousands of people for several hours. State broadcaster ZNBC says the blackout affected residents in Livingstone and surrounding areas Sunday and reports that it was caused by an accident involving "a curious animal." JOHANNESBURG (AP) — These are edgy times in Zambia, once considered one of Africa's most stable democracies. President Edgar Lungu this week announced extra police powers to deal with what he says are growing security challenges, including a fire that destroyed the biggest market in the capital, Lusaka. Three former champions lost at home at the start of the final round of qualifying for the 2019 African Cup of Nations on Saturday, with Ivory Coast, Nigeria and Zambia all slipping up. Ivory Coast was beaten by Guinea 3-2 after leading 1-0 and 2-1, Nigeria lost to South Africa 2-0, and Zambia was upset by Mozambique 1-0. HARARE, Zimbabwe (AP) — Police in Zimbabwe say a bus traveling to Zambia has crashed, killing 45 people. JOHANNESBURG (AP) — The leader of South Africa's main opposition party on Friday sharply criticized Zambian officials who denied him entry to their country as he tried to show support for a jailed opposition leader. Mmusi Maimane of the Democratic Alliance said officials boarded the plane on arrival in Zambia and "started to assault" him, temporarily confiscating his mobile phone and iPad and preventing him from leaving the aircraft. He returned to South Africa on Thursday. SEOUL, South Korea (AP) — Zambia and Uruguay advanced to the knockout stage of the Under-20 World Cup on Wednesday, both winning for the second time in two matches. The Zambians rallied with four second-half goals in an 18-minute span to beat Iran 4-2 in Group C, while Uruguay defeated Japan 2-0 in Group D.
LUSAKA, Zambia (AP) — Zambia's main opposition leader has been charged with treason after he was accused of obstructing the motorcade of President Edgar Lungu, the lawyer for Hakainde Hichilema said Tuesday. Under the country's penal code, treason carries a death sentence. JOHANNESBURG (AP) — Amnesty International says Botswana was the only country in southern African to execute a criminal last year. The rights group, which opposes the death penalty, said in a global report Tuesday that the single execution in Botswana was the country's first since 2013. Patrick Gabaakanye, 65, was hanged in May for the 2010 axe murder of an elderly man, according to media in Botswana. Matt Damon was stunned by the ambition of a Zambian teenager who "reminded him" of himself. The 46-year-old actor - who is the co-founder of charity Water.org - attended an event with Stella Artois at The Oculus at the World Trade Center in New York on Wednesday (03.22.17) to celebrate Word Water Day, and told attendees the story of a 14-year-old girl from Zambia whose dream of moving to the "big city of Lusaka" reminded him of himself when he was her age. LUSAKA, Zambia (AP) — Zambian police say eight people have died and 28 have been injured in a stampede during food handouts at a youth center in the capital, Lusaka. Police spokeswoman Esther Katongo said the stampede happened Monday when people forced their way into the Olympic Youth Development Centre, where the distribution of food handouts was scheduled to take place. ALBUQUERQUE, N.M. (AP) — Two New Mexico cities are donating emergency response equipment to their sister cities in Africa. Albuquerque Mayor Richard Berry says New Mexico's largest city will be donating firefighting gear along with a retired firetruck to the community of Lusaka in Zambia. LUSAKA, Zambia (AP) — A British law firm says one of its lawyers was arrested and held for hours in Zambia after meeting residents who filed complaints about alleged pollution from a copper mine. The Leigh Day firm said Thursday that lawyer Oliver Holland was in the southern African nation to meet communities who say the mine in Chingola is damaging farmland and water sources.